Watercolor on wood. 8 by 12″ $75.00 s& h 5.50. This painting is painted on 1/2 inch thick wood with watercolor. The wood was painted with gesso and sealed with acrylic medium. 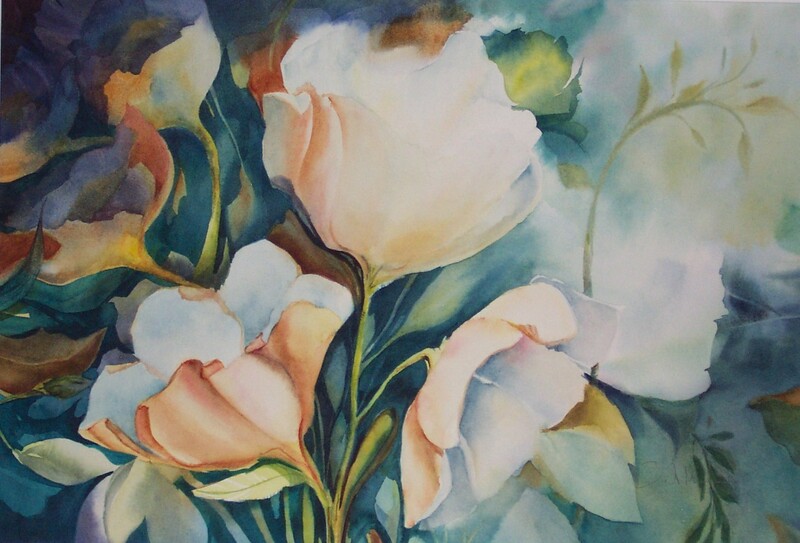 It can now be framed as an oil or acrylic painting. 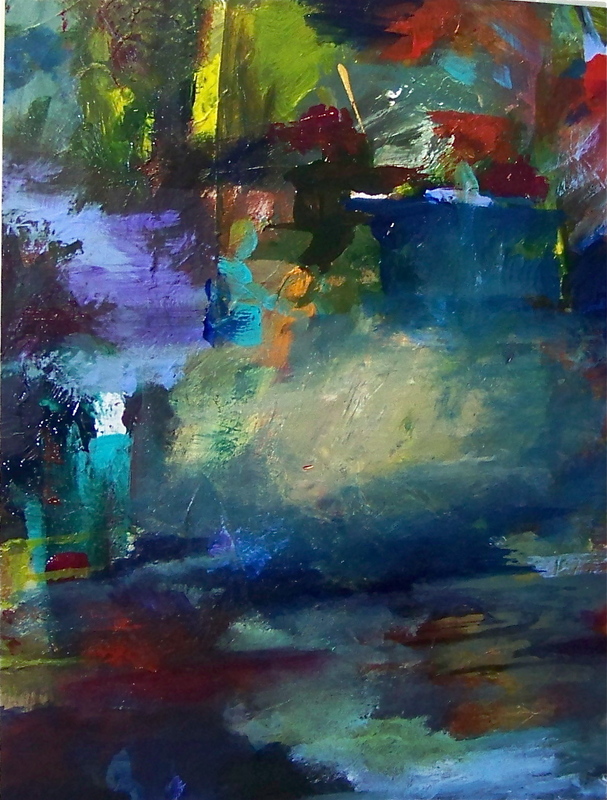 I like to paint abstracts and allow myself to use texture, color and contrast to suggest a narrative. A few more finishing touches and this commissioned painting will be ready to send to it happy owner. 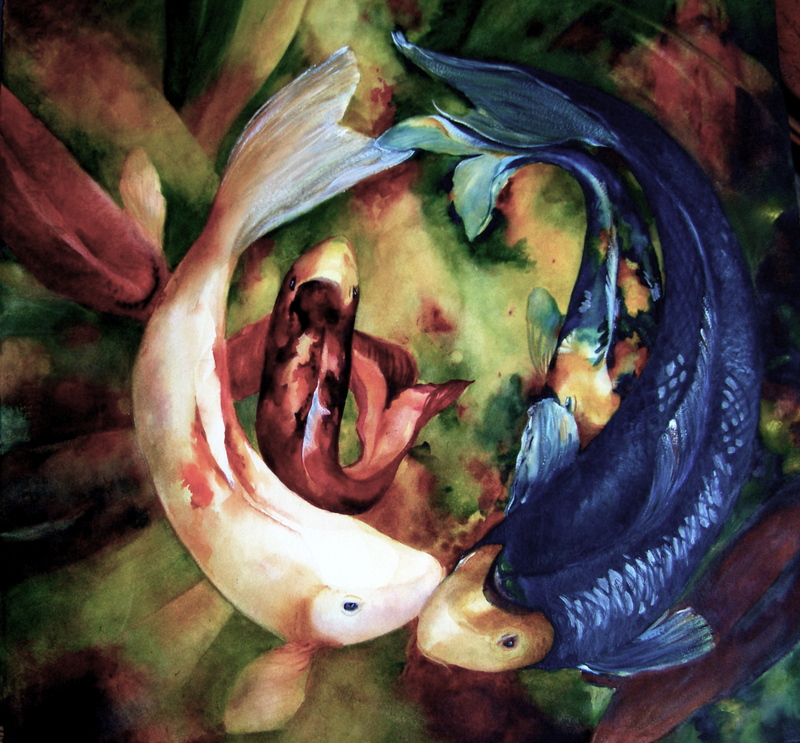 This is a family of Koi… The two larger fish are the parents, the white is the female and the black is the male. The little Koi are their offspring which are always protected by the parents. This piece is 22 by 22 on 300 lb artist grade Arches pure white paper. 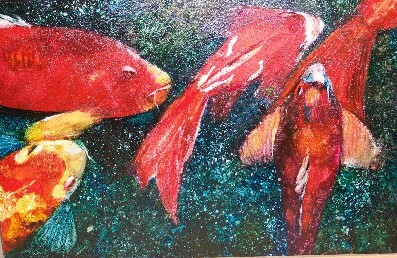 If you would like me to paint a koi painting for you, just send me an Email, and we can discuss it! This is a close up of my work In progress. I see these little guys sitting on tree limbs which are growing over the shoreline of Lake Wylie. The roots of the tree are grasping the earth like they will never let go while the branches lean way over, but one day that limb will surely be in the water. 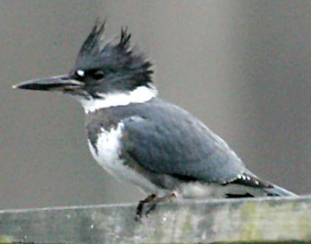 The King fisher of course will be onto another limb or sitting on a dock looking into the water. They really make a lot of noise when they call out. It sounds like laughing or chattering. I stand under the trees and watch them fly, often only a foot or so above the water and once in a while I’m surprised with a sudden dive and out again with a small fish still wiggling in their mouth as they take to the air. much this week, that and the fact that we had company staying at our condo for about a week. 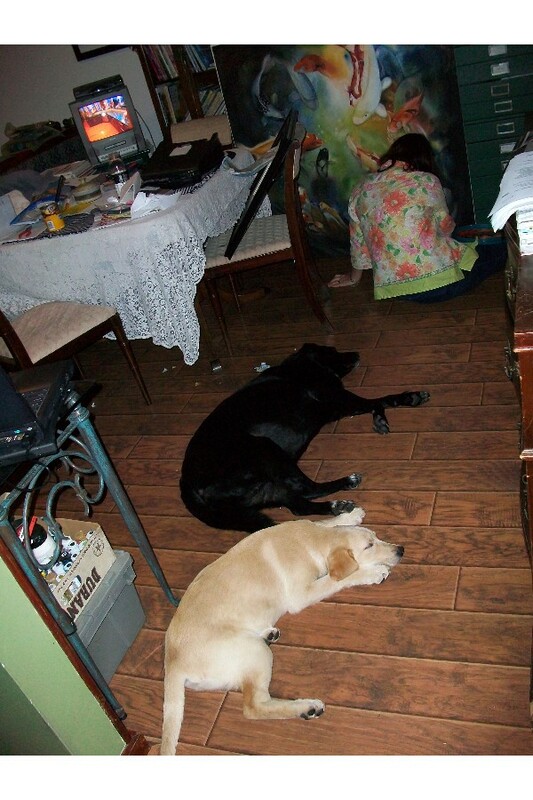 You can see the dogs are really interested. This is Oil on canvas about 48 by 48. 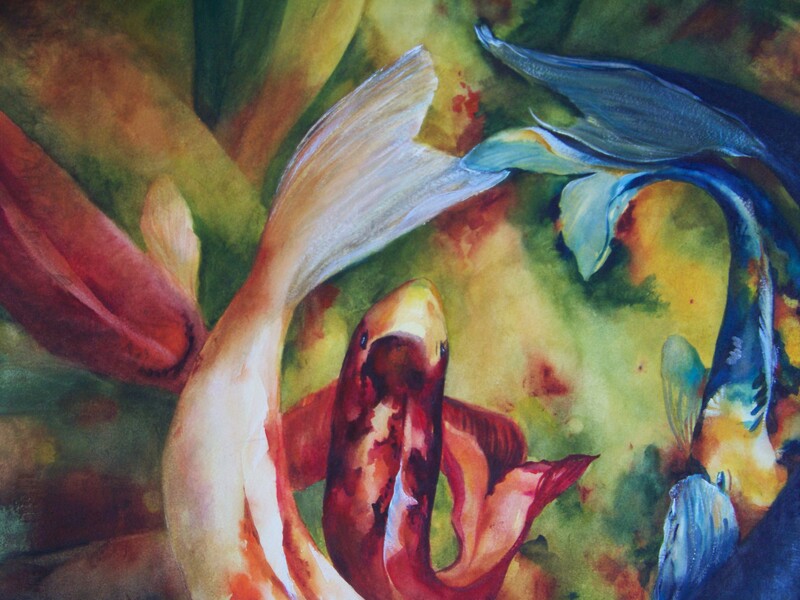 Watercolor on paper 22 by 15$ 300.00 I love the blue color that I used in this painting. I wonder the woods looking for inspiration and most of the time I find little tiny tiny corners of the under brush which is a microcosm in itself and I just have to make it BIGGER. These flowers were really just thimble size but they were magnificent!